This article is about the Canadian fast food chain. For other uses, see Harvey. Harvey's is a fast food restaurant chain that operates in Canada, with locations in every province. It serves hamburgers, poutine, hot dogs, french fries, onion rings, and other traditional Canadian fast-food fares. The chain is owned by Recipe Unlimited (previously known as Cara Operations). Harvey's is the second-largest Canadian-established restaurant chain in the country behind Tim Hortons, and the fourth-largest burger chain in Canada. Harvey's is known for its grilled burgers and for providing customers with the choice of several various toppings. Harvey's was co-founded by George B. Sukornyk and Rick Mauran in early 1959 as equal shareholders. Mauran originally thought to call the chain Humphrey's, riffing off of the down-home friendliness connoted by the Henry's Hamburgers chain that was already successful in the United States at the time (today, only one Henry's restaurant survives). As he was preparing to open the first restaurant in the summer of 1959, he saw an item in the now-defunct Toronto Telegram indicating that the John Harvey Motors car dealership in the city was closing, and the sign — which simply designated it Harvey's — was available. Mauran obtained the sign and posted it outside his flagship store. The first Harvey's location was opened on April 1, 1959, at the southeast corner of Yonge Street and Observatory Lane in Richmond Hill, Ontario, on a 10-acre (40,000 m2) parcel of land purchased from the owner of a bankrupt Dairy Queen. The location was initially expected to be seasonal, based on the precedent of the local Dairy Queen location, but it was successful enough to remain open year-round. The first franchised location was on the company-owned property on Avenue Road. Subsequently, the land was purchased for additional locations to be developed and franchised in Etobicoke, Hamilton, and Scarborough. The 238 Bloor Street West location in Downtown Toronto, opposite Varsity Arena, was opened as a company-owned and operated location, but was sold by Cara in early 2006 to One Bedford, a condominium project. 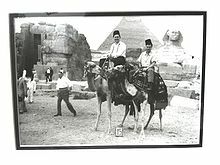 Beginning in 1963, Harvey's purchased 39 parcels of land in Niagara Falls (ON), Ottawa, Montreal, and Winnipeg, as well as one U.S. location in Buffalo, New York. Sukornyk insisted, where possible, that all property be company-owned in order to provide equity and stability to the company's balance sheet. In 1959, Harvey's introduced three original concepts in the drive-in take-out business. The first concept was for a customer to order, purchase and obtain a receipt, which was placed on the topping counter. The cash was immediately placed in the cash register, thereby controlling and monitoring cash, and keeping theft to a minimum. 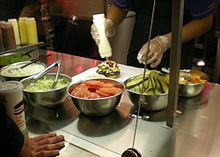 The second concept was to have the customer move along the counter, following his/her receipt, and then, at his/her request, have an employee "customize" his/her hamburger with a variety of toppings. The third concept — developed for its full-line Swiss Chalet restaurants in Montreal — was to purchase potatoes from Prince Edward Island, have the franchisee wash and cut the fresh potatoes into oversized chips with skin on, and then deep-fry and serve the chips on-site. This approach was a distinction between thin pre-frozen and pre-cut French Fries of unknown origin that were being sold at the time. Ten years later, under different management, the number of toppings was substantially increased, and pre-frozen and pre-cut string French Fries were introduced, replacing the freshly cut PEI potato. Harvey's Food Limited merged with Industrial Growth Limited in the early 1970s to form Foodcorp, led by president Bernie Syron. The company grew to operate 80 restaurants, and was acquired by Cara Operations in 1979, which has since rebranded as Recipe Unlimited. After going through four different flagship burgers in twenty years, Harvey's introduced the Great Canadian as its flagship burger in 2010. It was discontinued in 2013 and replaced by the Angus burger, which has served as the chain's flagship burger since then. In February 2012 the first Harvey's location was demolished to make way for condominiums. In the summer of 2012, Harvey's added Dole Strawberry Kiwi as a fountain juice. Later in November 2012, Harvey's introduced a Health Check approved section for its menu. This includes the veggie burger, the grilled chicken sandwich, the Lil' Original and the grilled chicken salad. Only approved toppings, condiments and dressings may be used on the sandwiches for them to meet the Health Check requirements. The Lil' Original has a price of $1.99, comparable to those found on competitors' value-priced burgers. Harvey's claims that in 1998, they were the first to introduce "Custom Combos", allowing customers to modify their combo with different items from those usually included. At a select number of locations, breakfast is served along with "Frings" ("Fridelles" in French), which are half french fries and half onion rings. As of December 2017, Harvey's employed more than 6,000 employees and operated 274 restaurant locations across Canada. Harvey's introduced their Angus burger series as a competitive measure to McDonald's, which first introduced its own Angus burgers in Canada in 2008. Harvey's presently uses all-Canadian beef. In October 2008, over 200 people were infected with the O157:H7 strain of E. coli due to contaminated onions at the North Bay, Ontario location. There was a class action lawsuit against Harvey's; the end result was a cheque for $1,000 to $7,250 per victim. 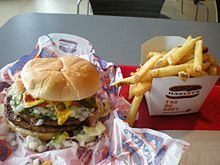 There is no affiliation between Harvey's and the American hamburger chain Hardee's, despite their names sounding nearly similar to each other. The latter's parent company CKE Restaurants has been prevented from opening stores in Canada under the Hardee's name due to a trademark dispute. CKE has instead launched the Carl's Jr. brand in Canada. Harvey's began a partnership with Scene in February 2015. Harvey's advertising takes the form of promotional coupons, social media presence on Facebook and television commercials. On the last Sunday of May each year in 2007, 2008 and 2009, Harvey's held a Free Original Hamburger Day at all locations across Ontario and Quebec. The purpose of this event was to "celebrate Canada's best tasting burger" and to attract new customers who might not otherwise go into Harvey's. These events were loss leader sales where Harvey's hoped to sell side items and create customer loyalty. The event was extended across Canada in 2008, and later in 2009 to coincide with the chain's 50th anniversary. All these events were limited to one free burger per person. From 2010 onwards, the event was changed to a "Free Burger Week" in June of every year, but now works as a "buy one, get one free" instead of a completely free burger. However, there is no longer a limit of one per person, and any burger (including chicken and veggie) can be obtained with the new deal. In the early 1990s, some Harvey's locations featured items from the American chain Church's Chicken. After Cara acquired Harvey's, the Church's partnership was ceased and replaced with Swiss Chalet. In some cases, locations are located adjacent to or co-located with Swiss Chalet locations. There are also a few Home Depot Harvey's stores that are co-located with Second Cup, a coffee chain that used to be owned by Cara. ^ "Harvey's, Swiss Chalet owner eyes IPO, sees major growth ahead". U.S. February 17, 2015. Retrieved December 27, 2017. ^ Canadian Business. CB Media. 1977. p. 30. Retrieved 2009-02-08. ^ Lorinc, J. (1995). Opportunity knocks: the truth about Canada's franchise industry. Prentice Hall. p. 119. ISBN 978-0-13-455693-2. Retrieved December 27, 2017. ^ a b Giorno, Frank (2016-12-22). "2017 brings two favourites Harvey's and Swiss Chalet to Timmins' dining menu". TimminsToday.com. Retrieved 2017-12-27. ^ a b c Mirsky, Jesse (March 13, 2012). "Original Harvey's restaurant demolished to make way for condos". National Post. Retrieved March 13, 2012. ^ a b Bateman, Chris (25 January 2015). "That time when Harvey's hamburgers came to Toronto". BlogTO. Retrieved 16 February 2017. ^ Gallagher, Danny (27 July 2007). "Behind the Burgers, a Man of Mystery". National Post. Retrieved 16 February 2017. ^ Filey, Mike (2003). Toronto Sketches 7: The Way We Were. Dundurn Press. pp. 53–54. ISBN 978-1-55002-448-7. Retrieved 2009-02-08. ^ "St-Hubert Group set to expand the Harvey's brand throughout Quebec". CNW. 4 December 2017. Archived from the original on 1 February 2018. ^ Pub Québec - Harvey's. ^ Harvey's avec Bernard Fortin. ^ "Hicks Weekly Dish: War of the classic burgers". Edmonton Sun. August 19, 2014. Retrieved December 27, 2017. ^ nurun.com. "Beefing it up | The London Free Press". Lfpress.com. Retrieved 2017-12-27. ^ "The beef question: Wall criticizes A&W for using non-Canadian producers". Global News. September 7, 2017. Retrieved December 27, 2017. ^ "E. coli outbreak in North Bay linked to Harvey's restaurant". CBC News. October 16, 2008. ^ "2008 North Bay E. coli outbreak settlement approved by judge". CBC News. March 19, 2014. ^ "Carl's Jr. set to launch in Ontario". Canadian Restaurant News. ^ "2006 Slogan". Harvey's. Archived from the original on November 18, 2006. Retrieved 2012-10-26. Wikimedia Commons has media related to Harvey's. This page was last edited on 27 January 2019, at 05:49 (UTC).